In a small bowl, stir together the beets, olive oil, vinegar, and sea salt. Set aside. Layer in a half cup of yogurt into the bottoms of two mason jars or other tall glass jars. Top each yogurt layer with some of the beets, some of the cucumber, and half of the feta cheese. 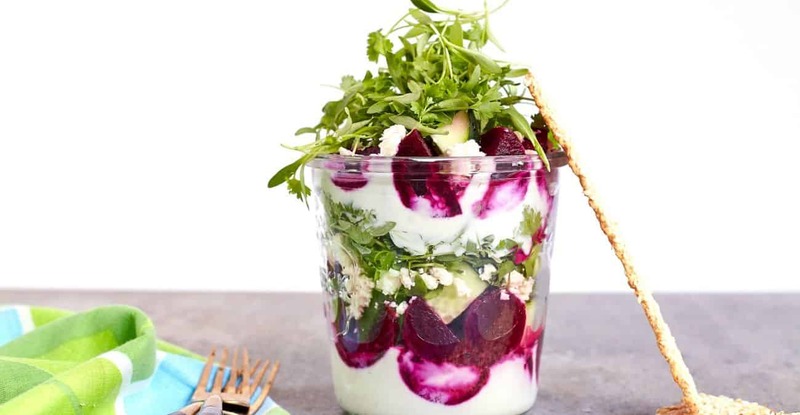 Add a thick layer of micro greens and repeat by layering in the remaining yogurt, beets, cucumbers, and cheese. Season with black pepper, if desired, and garnish the tops of each with a generous amount of micro greens. Enjoy immediately or keep chilled until ready to serve.